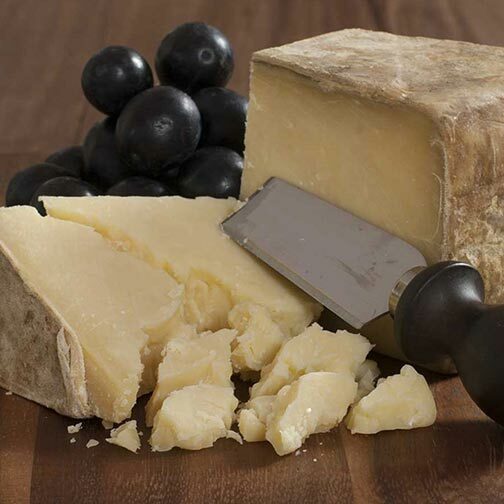 Cabot Clothbound Cheddar is produced in the Northeast Kingdom of Vermont from a wildly successful collaboration between The Cellars at Jasper Hill and Cabot Creamery. Cabot Co-Op’s own Kempton Farm was selected by The Cellars to be the sole producer for the Holstein cow’s milk used in its production. This bandaged-wrapped cheddar combines a classic old-world technique with The Cellar’s cutting edge aging facility. Immediately after the wheels are unmolded from their cheddar hoops they’re delivered straight to the Cellars. The young wheels are lovingly wrapped in muslin like a newborn being swaddled, then smeared with lard which acts like as a natural sealant. For the next 10-15 months The Cellars wine and dine these developing beauties with constant brushing, turning, and quality monitoring. Cabot’s grip on the American gut lies in its perfect palatable design. Its flavors boast a blend of sweet and savory that is suitable for all levels of tasters. The texture is dense and slightly brittle, with a distinct sharp, sweet and nutty paste.